SUBHEAD: Blackfeet Tribe swayed the Interior Department to cancel the leases in Badger-Two Medicine River area . Image above: Blackfeet sacred land in the 170121saceedBadger - Two Medicine River area. From (http://grist.org/article/oil-and-gas-leases-canceled-on-blackfeet-sacred-land-in-montana/). Wednesday morning, as John Murray drove north from his home on the Badger-Two Medicine River to his job as the historic preservation officer for the Blackfeet Tribe, the mountains glowed red. His wife, who drove with him, commented on their beauty. Murray, 69, noted with deep satisfaction that for the first time in more than 30 years, there are no more oil and gas leases up there. For thousands of years, the area was home to the Blackfeet, and Murray has spent decades fighting a collection of oil and gas leases sold for $1 an acre by the Reagan administration without consulting the tribe. On Tuesday, Interior Secretary Sally Jewell canceled the last two leases in the area known as Badger-Two Medicine, which now is part of the Lewis and Clark National Forest. “The cancellation of the final two leases in the rich cultural and natural Badger-Two Medicine Area will ensure it is protected for future generations,” Jewell said in a statement. Anthropological studies have found hundreds of artifacts in the area, but it’s the landscape itself that is most treasured by the Blackfeet, Murray says. That landscape also is extremely important to conservation groups because it provides crucial habitat for grizzlies, mountain lions, bighorn sheep, mountain goats, and the other fauna that roam between Glacier, the Bob Marshall Wilderness, and the Blackfeet Reservation. Hunting and fishing groups laud the area as unmatched for elk hunting and wild trout fishing. But conservationists who worked to preserve it say it was the Blackfeet that swayed the Interior Department to cancel the leases. The decision comes as the Obama administration has sided with tribes in other recent decisions. The U.S. Army Corps of Engineers early last month suspended an easement necessary to finish the construction of the Dakota Access Pipeline, pending a deeper environmental assessment and consultation with the tribe. On Dec. 28, President Obama created two national monuments after intense campaigns by Native Americans: Bears Ears in Utah and Gold Butte in Nevada. The hard-fought victory for Badger-Two Medicine comes at a time Murray sees as a renaissance for the Blackfeet people. The tribe also negotiated an important water settlement with state government, which Congress finally approved last month. Now that the leases have been canceled, the tribe is looking forward. “Our next move is to be more proactive in what happens in the Badger-Two Medicine,” Murray says. Specifically, the tribe is advocating for the Lewis and Clark National Forest to stop allowing cattle grazing and instead reintroduce buffalo. In November, Interior announced that Devon Energy had agreed to the cancellation of its 15 leases in the Badger-Two Medicine region. But another company, Solonex LLC, is fighting the earlier cancellation of its lease in the same area. That dispute, which is currently in front of a federal court, tempered the celebration of the Blackfeet’s long-awaited victory. 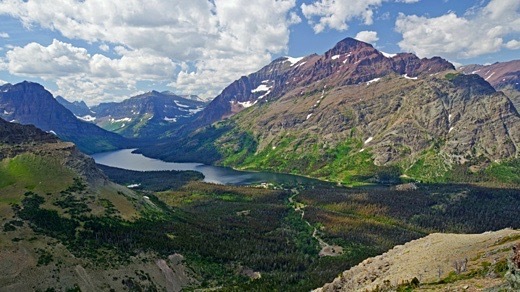 Michael Jamison, Glacier program manager for the National Park Conservation Association, first protested the leases as a college student some 30 years ago. Through the years, he has learned from Blackfeet elders why the landscape is so important to them.